GARETH WRIGHT is looking for a strong finish to his year after wiping away the rust to provide himself with a winter warmer. The West Linton pro posted a three-under-par 68 to win the latest Scottish Pro Winter Series event at Leven, beating new European Tour card holder Jamie McLeary by a shot. “I was really pleased with the win as it’s the first time I have competed since the Tomatin Pro-Am,” said Wright of the Tartan Tour 54-holer held at the end of September. “I was six-under through 14 holes in what can only be described as miserable weather and my only blip was really on the last when my driver completely slipped out my hand. That left me 200 yards into the wind and I hit what I thought was a good shot but came up 20 yards short in the water and took double. That was reference to an upcoming double-header for Wright there – the PGA Play-Offs starting next Friday at Antalya Golf Club, followed by the PGAs of Europe International Team Championship at Gloria Golf Club. He’s flying the Tartan Tour flag in the former with Chris Kelly, Greig Hutcheon and Graham Fox. He then joins Fox and David Orr in defending the title in the latter. His main aim in the PGA Play-Offs, a 24-man field made up of the top players from all seven of the PGA Regions, that is the same as when he finished third in 2012 to secure a spot in next year’s BMW PGA Championship at Wentworth. “With the weather being so bad the last few weeks, my prep for the Play-Offs and the International Team Championships has been limited to mainly indoor work with the camera and Flightscope,” said Wright. Being run by former Scottish Golf performance development manager, Kevin Cademy-Taylor, the new winter series is being well supported by Lothians players. 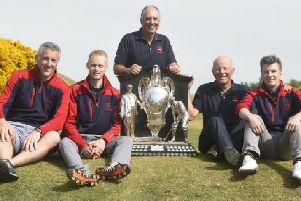 In addition to Wright and McLearey, the Leven line-up also included Andrew Oldcorn, who finished third on 70, as well as Zander Culverwell, Neil Henderson and Cameron Marr. Trying to stay competitive in the build up to the LET Qualifying School final, Jane Turner played in it as well.